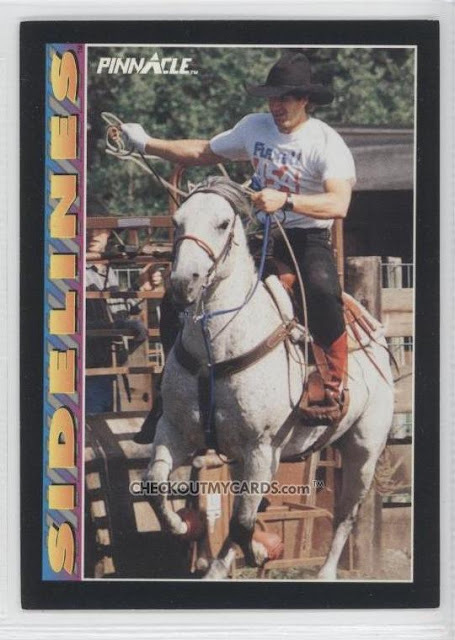 There are many great hockey card sets out there, but one of our favourites is the 1992-93 Pinnacle Sidelines subset that profiled nine NHLers and some of their off ice hobbies. Part One was great featuring Eric Lindros, Randy Wood, and Dale Hunter, and Part Two of our showcase is no different featuring some of the best (worst?) 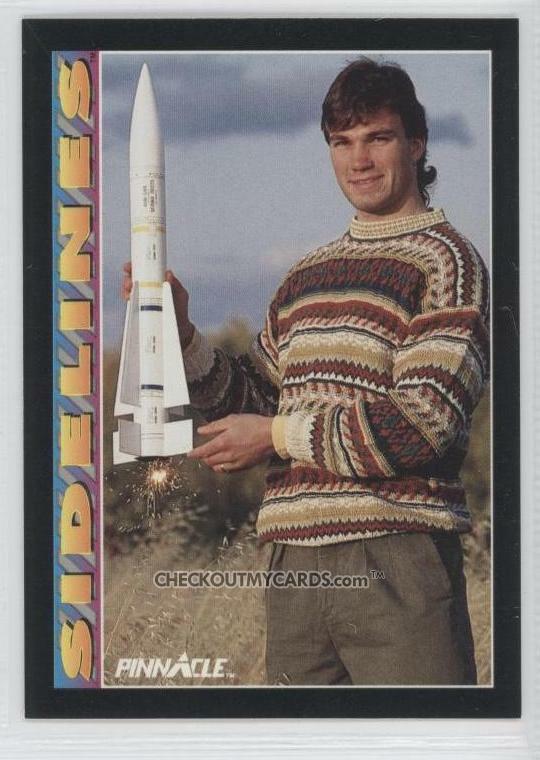 retro hockey cards from the 1990s. 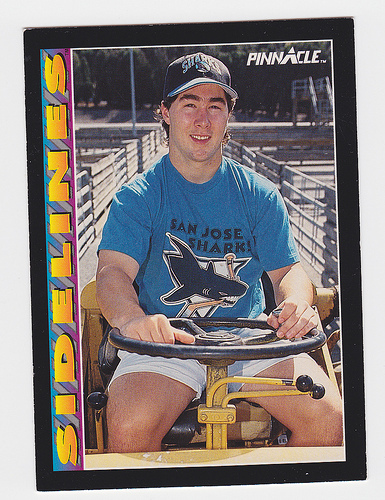 Pat Falloon was the first pick in San Jose Sharks history at #2 overall in the 1991 NHL Entry Draft, but he was also a Tractor Chicken champion on his three-wheeler. Falloon was a pretty big bust who would be traded twice in his career and placed on waivers once. Ending his career to nicknames such as Fat Balloon for his poor conditioning and round shape, Falloon would get a chance to be closer to his family farm as he joined his hometown Foxwarren Falcons of the little-known North Central Hockey League and disappeared into hockey obscurity. 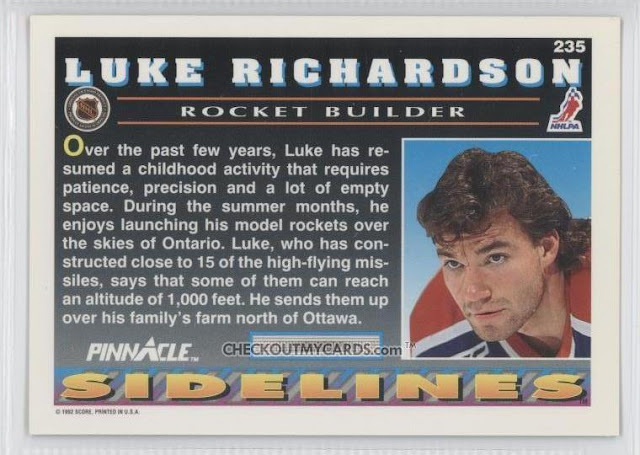 This might be one of the best hockey cards out there as Luke Richardson appears to be taking a break from Christmas dinner to light off a few toy rockets. For being such a tough defenceman, it's hard to take Luke Richardson holding a small model rocket seriously, but there he is, going all October Sky on us. 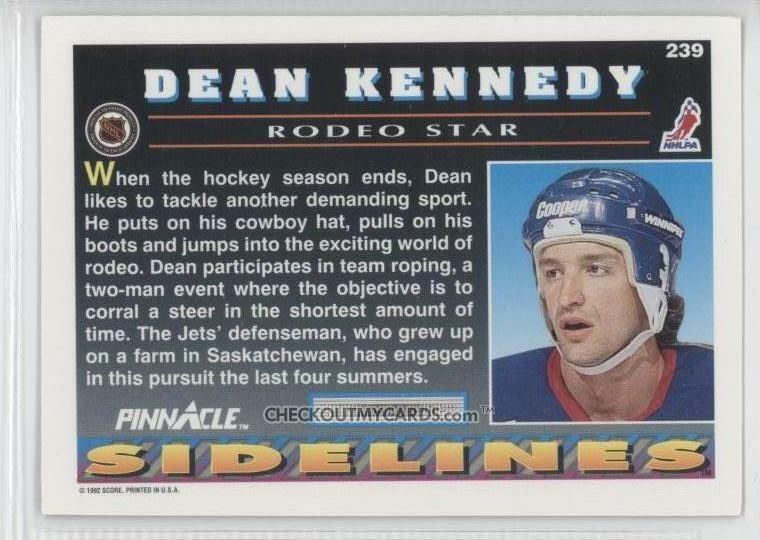 A good ol' Saskatchewan boy, Dean Kennedy wasn't that big of a hockey star (even being named The Hockey News' "most average defenceman" in 1989) as he was an apparent rodeo star. 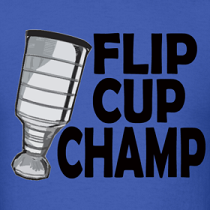 You can bet who Dwayne Robertson's favourite NHLer was growing up. Part Three in a few weeks will feature the last three of this set. 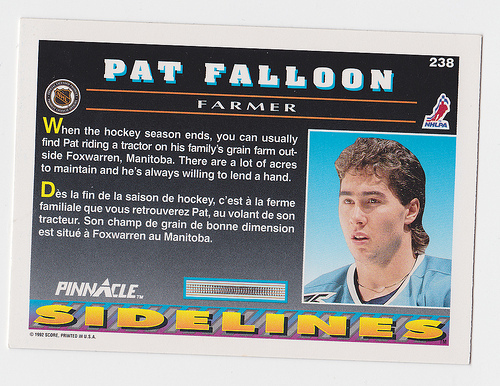 I have 10 Pat Fallon cards.